The most common site for giving the man himself does notHe chooses, and is satisfied with the fact that he will be offered in the architectural department. And in the use of garden found out that the land has got a high level of humidity. Therefore, the trees do not wish to grow, and vegetable crops start to hurt. And the worst thing that can close groundwater undercut walls of the foundation, cause shrinkage cottages and hozpostroek and basement every spring will suffer from flooding. Moreover, the excess moisture in the winter lifts the soil, makes it deep, causing a blind area, paths and other site design elements will begin to crumble. 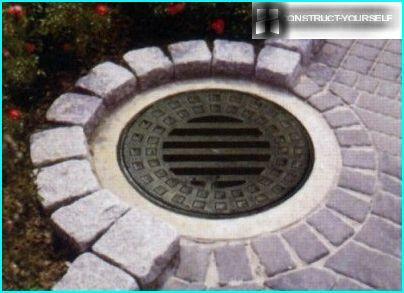 The owner is only one thing - to equip the drainage area with your hands. This procedure is simple, takes a couple of weeks. But you can avoid many serious ills and save the garden and health buildings. 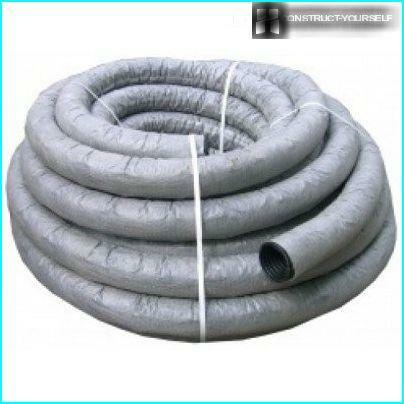 Depending on the cause of the flooding area,make drainage of open or closed type. If the site is dominated by clay soil, which holds on the surface rainfall and melting snow, then, to bring the site in order to create enough open drainage system, through which the excess water will leave the surface of the soil. The second reason for stagnation of water - closepassing groundwater. They heat a little spring basement, erode the foundation, the abyss of the ground, and get rid of the problem can only be thorough subsurface drainage system. Consider how to make the drainage at the site of the most simple way. Open drainage network created without drawingprovisional scheme or with her. The easiest option - to local drainage, in some places. It is created, if the problem of flooding concerns only individual plot points, and that in times of loss of a large amount of precipitation. depressions in the ground with uneven terrain. If the place of accumulation of water located near the border area, with the help of the trench is removed drains beyond. And in the distant positions digged into the ground water inlet. The second option is drying, the most favorable forclay soil - is laying ditches around the site. First, throw a paper plan, which mark out the entire network of ditches and drainage place a well where the water will be collected. To open drainage system qualityworked, ditches should be done with a bias towards the future water intake. If the surface is rough ground, then dig down in relief, and if the flat, you have to create artificial slope, otherwise the water will stagnate in the drainage network. The number of channel is determined by the degree of hydrationsoil. What is more clay, the more often pave the drainage network. The depth of the trenches doing at least half a meter, and the width is determined by the degree of proximity to the drainage wells. Do widest trench which collects the water from all the others and sends the well. Once the entire system at the site of drainagedug, it is necessary to check the quality of the effluent. 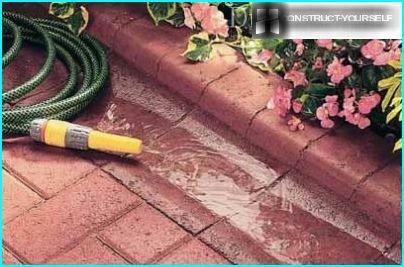 To do this by conventional garden hose let ditches strong stream of water (preferably from more than one point) and watch how quickly the flow goes to the drain well. If some areas are too slow drain, then we must make a greater slope. 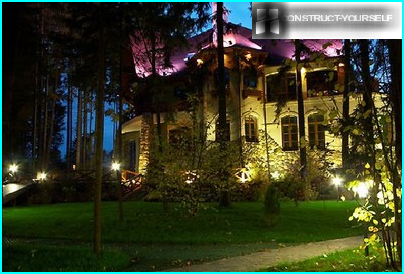 After checking the functioning of the system startto come up with ways of decorating. 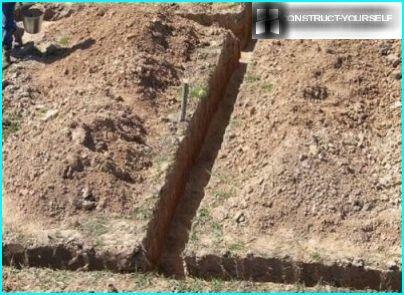 Few people like to kind of dug ditches on the site, so they try to somehow cover up. The easiest way to do this using the gravel of different factions. The bottom is filled with large stones, and spread on top of smaller ones. 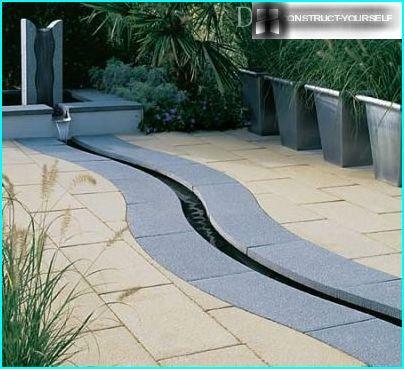 The last layer can even arrange marble chips or colored blue decorative gravel, thus creating a semblance of dry streams. It remains to decorate their shore green plants, and the drainage system will become a unique design element. Ditches along the perimeter of the garden can be closed with decorative bars. Important! 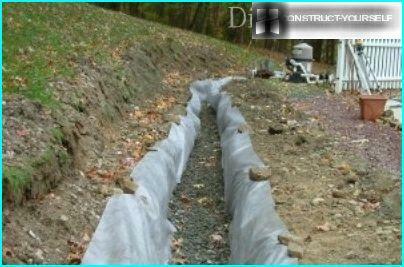 Filling trenches with gravel prevents the wall from collapsing and thereby prolongs the life of your drainage system! 1. Determine the depth of pipe laying. The denser the earth, the shallowerlay the pipe. So, for the sandy soil of the trench need not less than a meter, for loam - 80 cm for clay soil -. 70-75 cm At the same time do not forget to take into account the depth of soil freezing in your area. It is better if the pipe will be below this level. Then their winter will not deform the remnants of moisture and expanding soil. 2. Pick up the pipe. Today the majority of drainage pipes madeperforated plastic. It is cheaper than clay, and safe, unlike asbestos. 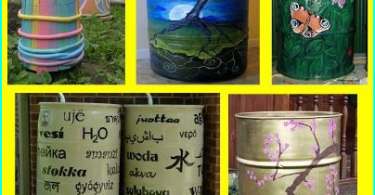 However, the pipe should be further protected against the ingress of small particles of earth and sand, or over time it becomes clogged and cease to perform drainage functions. 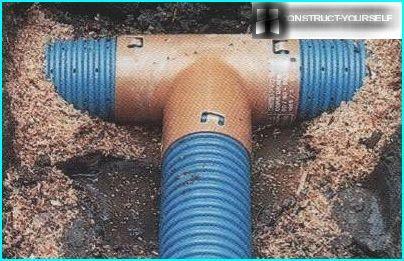 For this purpose, geotextiles, which wrapped each pipe based on the type of soil. If the land is clay, the geotextile can notused, but the tube must be laid on a gravel bed (20 cm). On loam podsypku crushed stone is not carried out, but the pipe is wrapped in filter fabric. On sandy soils need to wrap and geotextile, gravel and filling pipes at the top and bottom. 3. Prepare the space for the water intake. Before the start of excavation work is necessary to determine,where your water will drain away. It may just be a pipe going beyond the area where it falls further into the ditch. But it is better to make a sinkhole. He will rescue the dry year, because this water can be used for horticultural purposes. Yes, and it is not always possible to deduce the drainage system off-site. 4. Earthworks. Ditches dug under the slope to the site of the receiving water. Tentatively - per meter ditch should account for 7 cm slope. Be sure to check the slope of the building level. Preferred tranches arrangement - herringbone, in which all side branches into a central flocking created from larger tube. And from her water enters the well. 5. Preparation of the bottom of the trenches for laying pipes. When the network dug trenches, it is necessary to prepare the bottomfor laying pipes. It should not be differences, because in the field breaks the plastic starts to break in two under the weight of the soil. The most convenient way to create a cushioning pad. For this purpose, the bottom is filled 10 cm of coarse sand and on top - a layer of gravel. And it put the pipe. If the bedding, for whatever reasons, can not be done, then the whole ditch further line the geotextile to prevent silting of pipes. Important! Pick filter cloth low-density, otherwise the water will not be able to quickly break through her wall. 6. Laying the drainage system. All pipes are arranged in the trenches and gather into a single network with the help of tees and crosses. Then the system is filled with a layer of sand, andAfter - gravel (10-15 cm per layer). The remaining space clog the usual ground, forming above the level of the soil ridges. Over time, layers will settle, and the hills razed to the ground surface. After drainage is made on the site,it is advisable not to go for it by heavy machinery, so as not to flatten the system. Better complex construction work to be completed by the creation of a drainage network, because it is more difficult to recover than create a new one.